On the 2nd day of February, 2019, The great leader of IPOB, Mazi Nnamdi Kanu and his eagle eyed deputy Mazi Uche Alphonsus Mefor sat on Radio Biafra London to categorically address the issue of the Nigeria Presidential election boycott and as well Biafra Referendum. Recall that the Biafra Referendum was publicly declared to ensue on 16th February by the IPOB leadership on the 28th day of February, 2019, the same day, the Nigeria Presidential Election is due to take place. The fixing of the Biafra Referendum on this same date (16th February) with the Nigeria Presidential election has raised many questions and confusion among the Biafran people as to how possible it will be for IPOB to succeed in this quest. Tonight, Mazi Kanu and his Deputy, Mefor successfully addressed the issue on radio Biafra London. They gave many reasons why Biafrans must boycott the Nigeria Presidential election. One of such reasons is that the Nigeria leadership system is designed by the Fulani Islamic caliphate to favour them and them only and disfavour other region, such as Biafran people and this can no longer wash with us. He said that since the people have been voting since 1999 when this evil constitution was created, and it's not working, it never worked, they should at least try something else (Boycott the system)because insanity according to Einstein "Is doing the same thing over and over again and expecting a different result." As we all know, Mazi Nnamdi Kanu, the leader of IPOB is a "Wise Man,"
and his Deputy, Mazi Uche Mefor is equally a Wise man, you can then imagine what would be the out come when the both of them come together to address an issue. Tonight, being 02.02.2019, the two wise men, both sat together and broadcasted on Radio Biafra London. You can picture in your mind the huge spark their wisdom had produced, the impact their speeches have made in the lives of their listeners out there. May Chiukwu-Abiama take all the glory! So, I urge our African brothers out there to always stay tuned to Radio Biafra London so as to get healed from their long term confusion as a black man. "Election Boycott in Biafra land, come this 16th of February 2019 is a must on the part of Biafrans, unless the Nigeria government responds to my request," Kanu had said. Speaking further on the same issue, he also said, "Our people must reject the 1999 Constitution designed by the Fulani Islamic Caliphate to rule over us." The freedom of the Biafran race remains IPOB ultimate goal and she is not relenting in the pursuit of this God's Kingdom from being restored on this very earth. 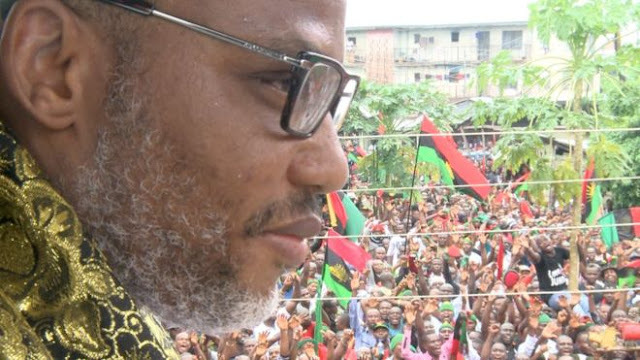 "Nothing stops Biafra, not even our stupidity as black people for it is obvious that when a black man is hungry he can even decide to work against his own family from whence he came, and that explains why we have so many Saboteurs in our land today working against the restoration of Biafra." Kanu finally concluded. One thing is sure, these saboteurs will always fail because Biafra restoration is something sacrosanct and ordained by Chiukwu Abiama. It can never be stopped, Work against it at your own peril! They may kill our people (IPOB family members carrying this heavenly Message of God's Kingdom on earth), they may humiliate and subjugate us, but in the end, Biafra will come and Chiukwu Okike Abiama shall take all the glory. In conclusion, the boycotting of the Nigeria Presidential election is the IPOB indirect way of "Referendum," as this will prove to the entire world how serious we are in our struggle for Biafra independence. On the day of this election, many International observers will be present to monitor the event and present their findings to their own people. This is to say, when Biafrans successfully boycott the election, these international observers will discover our plight and include it in their data. Therefore, it is important that Biafrans adhere to this directive/instruction issued out by the IPOB leadership that is fighting very hard to restore the freedom of her people from the contraption called Nigeria.